Oh man. I have loved this guy for so long. His every move is the least obvious choice and here he was, curating a fund raiser for the great work at House of St Barnabas and as you can see, a delight to shoot. Super friendly and he rocks a strong look. Great. I thanked him for two wonderful moments in my life - as a Plymouth-based, early 90s raver, I travelled to see him DJ in Exeter and went up after a killer set to shake the legend's hand (like you could back then). He said 'Did you like that last tune? ', I replied in the positive and he thrust it into my hand without a second thought. I made him reluctantly sign it and I still cherish it today. The other time was shooting him 10 years ago for an American music mag and I'd unwisely sought advice from this bloody friend who said he hated being photographed, hated flash, will want it done quick o'clock. I was then dreading the shoot inevitably as I really didn't want to dislike the guy, but he was a really generous subject and indulged my ideas and gave me time and his patience for a delightful shoot, with great results and a memory I'll cherish. 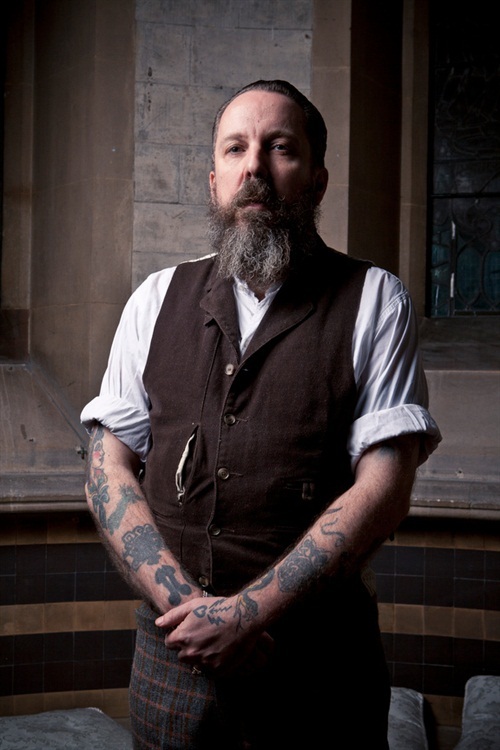 Andrew Weatherall - thank you for another quality experience at House of St Barnabas.